When we think of water in the West, we think of conflict and crisis. In recent years, newspaper headlines have screamed, “Scarce water and the death of California farms,” “The Dust Bowl returns,” “A ‘megadrought’ will grip U.S. in the coming decades.” Yet similar stories have been appearing for decades and the taps continue to flow. John Fleck argues that the talk of impending doom is not only untrue, but dangerous. When people get scared, they fight for the last drop of water; but when they actually have less, they use less. "Fleck's engaging journalistic odyssey...argues persuasively that the battle for water is not a zero-sum game." "This is not just a book for water wonks. Even if you care only enough to skim the headlines about the shrinking Salton Sea or Lake Mead’s burgeoning bathtub ring, Fleck’s book overall is a clear-eyed look at both the systemic inefficiencies in how water is used in the West and the smart ways they can be addressed." "Turn[s] the water crisis narrative on its head...an important book for all Westerners." "In 13 concise chapters, Fleck...illustrates how states, communities, and water rights holders have learned that the winner-takes-all approach to water management is a losing proposition." "With this book, Mr. Fleck employs the dynamic of storytelling to demonstrate that cooperative goals can be met when individuals unite to solve problems...I recommend this book as an inspirational and refreshing read for Colorado Basin aficionados and ordinary water users alike." "Herald[s] a new genre, one less focused on catastrophe than innovation...Fleck may be writing about water, but his real subject is human nature." "An informative yet exceptionally compelling journey through the evolution of the Colorado River basin management…Fleck provides an accessible, informative, and captivating look into water management issues and the ways in which we have adapted and persevered through water scarcity." "At the 1% extreme of thoughtful readble pieces on western water. The book is one of the most insightful and helpful works...since Cadillac Desert." "Outstanding...an enjoyable, informative read and a must for every water wonk's bookshelf." "John makes an excellent case that cooperation and collaboration is alive and well...a joy to read." "For anyone not conversant in the history of water policy and development in the Colorado River Basin, Fleck's slim volume covers the big-ticket items from the development of the 1922 interstate compact, to Hoover Dam, Lakes Mead and Powell, the Central Arizona Project, Salton Sea environmental issues, and, of course, Las Vegas." "Having covered environmental issues in the West for a quarter century, John Fleck brings a particular expertise to the pages of Water is for Fighting Over...[The book] is a fresh take on western water as it brings to light the true history of collaboration and examines the bonds currently being forged to solve the Basin's most dire threats." 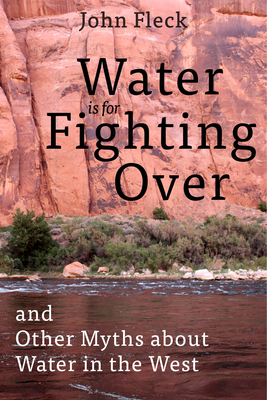 "John Fleck's Water is for Fighting Over is a smart, provocative, and ultimately hopeful look at how to solve water conflicts in the Colorado River Basin, the lifeline of the American Southwest. Fleck walks us away from the doomsday mentality of conflict and crisis toward a future that’s already emerging—one of mutual adaptation that capitalizes on the numerous untapped opportunities to do more, and better, with less water. The story of the West is indeed a story of water, but not the narrative we've had drummed into our heads." — Sandra Postel, Director, Global Water Policy Project and co-author of "Rivers for Life"
"Very entertaining and insightful perspectives about some of the most complex issues facing the Colorado River basin." "Amidst the gloom of prophesies about water shortages soon to beset the Colorado River Basin states, along comes seasoned journalist John Fleck with a powerfully optimistic narrative. In his telling, there is enough water, so long as the states converse rather than condemn, and collaborate rather than litigate. His fresh insights on the challenges facing the American Southwest should inspire everyone who cares about our most iconic river." — Robert Glennon, author of "Unquenchable: America's Water Crisis and What To Do About It"
"An insightful, behind-the-scenes look into water management in the West. The book not only explores the daunting challenges of growth and drought, but most importantly, highlights the many collaborative solutions that are the real, untold story of the last 15 years of the Colorado River."